Longmire Yeat Cottage Self-cateringA charming stone built character cottage, parts of which date from the 17th century and once a Quaker meeting house, Longmire Yeat with its panoramic views across the valley and fells will make a delightful holiday base at any time of the year. There are walks from the door for all ages and abilities. 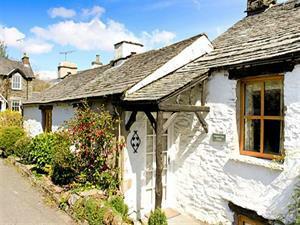 Troutbeck village is steeped in history with picturesque Lakeland cottages and a peaceful atmosphere - there are two excellent hostelries within walking distance of the cottage, and a little village shop/post office. Accommodation: The interior of the cottage is on various levels and the usual entrance is by the back door from the parking area. Rear porch. Useful utility area with ample space for storing your walking gear. Well-equipped dining kitchen with fine views across the valley from the dining table in the window and cosy log burning stove. Stairs to the first floor, which is ground level at the front, and into the delightful sitting room with full width picture window (TV, DVD, log burning stove). Two steps down from the living room lead to the hallway. Attractive bedroom with super king size bed (can be twin on request) which has a useful connecting dressing room with extra child's bed. Newly fitted bathroom (bath, shower, basin and wc). A double bedroom is accessed by a short staircase from the sitting room - some limited head room with sloping roof lines and fine views across the valley. Outside: Fine views. Private parking to the rear of the cottage for two cars. Sorry no pets * non-smoking * duvets/beds made up for arrival * TV and video * WI-FI * auto washer and dryer * electric hob and oven * dishwasher * microwave * fridge * separate freezer * storage heaters * all fuel included * logs for stoves available locally * travel cot and high chair available - please order * towels available - please order * garden chairs provided * parking for two cars. Other electricity by £1 meter. Phone for incoming calls and outgoing local and emergency calls. Children welcome from any age. Longmire Yeat Cottage offers weekly bookings starting on Friday. Longmire Yeat C offers weekly bookings starting on Friday.